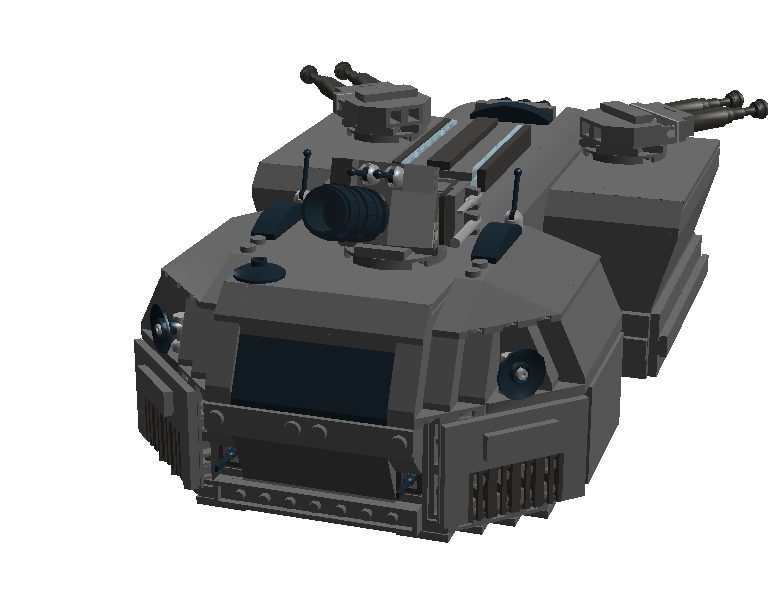 Weighing in at 68 tons, the MF-205 Savage Main Battle Tank is real heavy duty. With its dilithium powered repulsorlift engines, the MF-205 carries its weight at a top speed of 40 MPH. 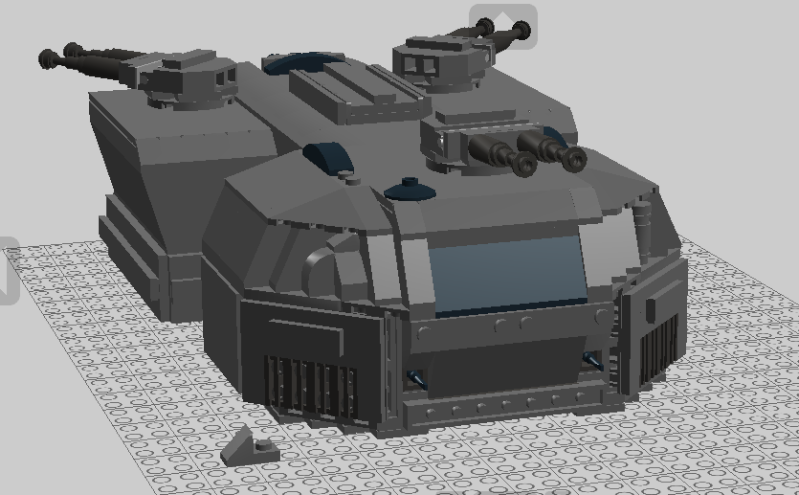 Keeping this brick protected is a standard Federation shield generator and 1.5 meters of ablative armor all around, making the MF-205 nearly impervious to light infantry. 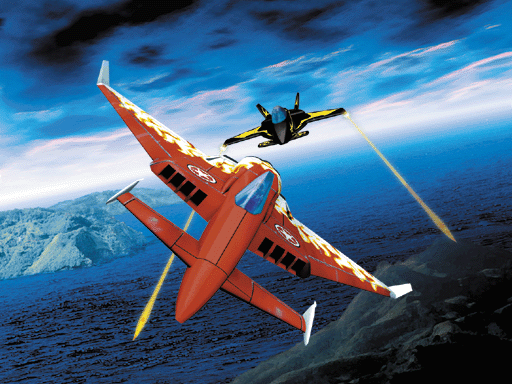 Three twin MP1750 heavy phaser cannons adorn the roofs of Star Force Savage tanks, though some special models come equipped with a photonic mortar cannons replacing in place of the front gun. Ooo, nice! I love that shape! Only one problem, though: a meter and a half of solid armor plating!? That seems a bit impractical, even for 24th-century (or whatever century we're in) technology. But other than that this beast is awesome!! 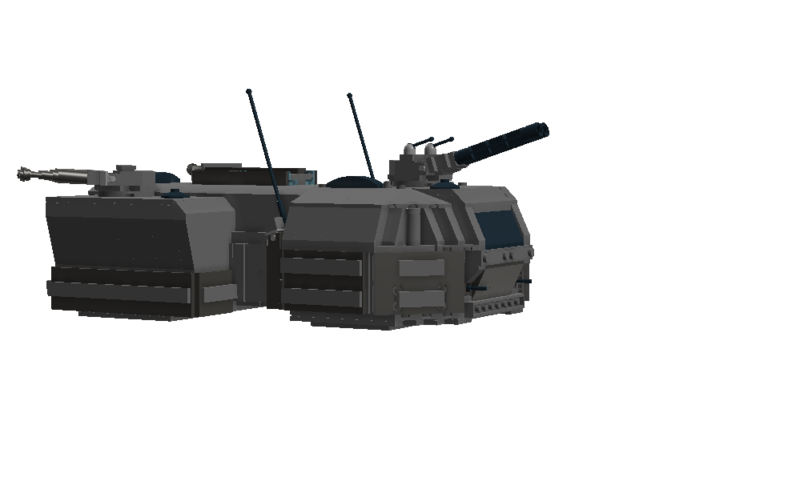 It definitely looks liek it's got almost 5 feet of armor, but I have a problem with only three heavy phaser cannons and it then being deemed a MBT. I would more of call it an "overarmored infantry support vehicle" (OISV). Stick some truly heavy weapons on that bad boy and then we'll have a real tank. Or make it a front lines command and control vehicle, that'ld be sweet, and the armor with just some phaser cannons would make sense, and it'ld look better with antennas and dishes and sensor pods sticking out of it. Or just stick a giant tank cannon on it. Or even a front lines AA variant, something that can roll out in the middle of the fight to shoot down enemy close air support, without fear of getting blown up by enemy ground forces. BTW, that's a sweet shot of the pilot's compartment. Got it, needs more guns. And more realistic armor amounts. I'm on it. Not more guns, bigger guns, so it's more like a tank. The armor is fine if you just make it a slow armored brick with big guns or some other purpose other than mowing down infantry/light vehicles. Nice work! I really like this thing! I would go with AA's suggestions, because they make sense to me. The only thing about the model itself that stands out to me as needing a little work is the front sloping side armor. I worked up a couple options to smooth that out real quick, feel free to use or disregard as you wish. 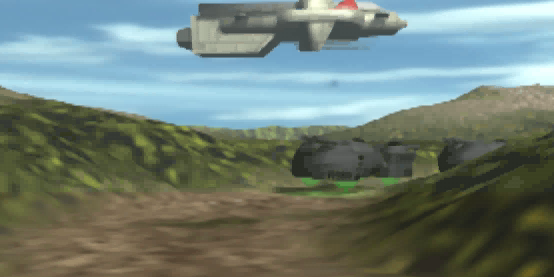 Otherwise, this is one cool hovering fortress! I love the entire thing, and it FEELS Trek to me, not any easy thing to accomplish with a tank. First off... I'd like to agree with Spud... a meter and a half is a LOT of armor. Like... over the top. That's basically the armor equal of putting a planet killer on a starfighter. I also have to agree with Ant that this is underarmed for being a "main battle tank", though I think its body style lends itself better to an infantry support vehicle or APC. If I were you, I'd just change the classification, and make something different for a tank. Now, on to my opinions on the actual design. I LOVE it! It looks great! Nice and open on the inside, but still well detailed. The overall shape of this is great as well, lookin' very nice. I also just want to comment that I love the lil' screencap you gave of it at the end. Where the heck did you get that? What game is it from? "The enemy gate is DOWN "
Class change could work. How does to MF-205 Savage Armored Fighting Vehicle sound? As for me, I don't have the original box but I've got the original CD. Here are two screens from the setup. And here's a video to the intro credits. 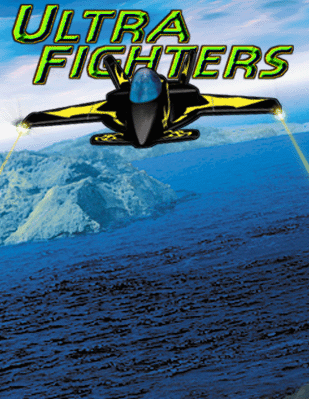 The game has singleplayer flight training, modem and LAN multiplayer, defunct online, and a singleplayer USA campaign. It's a pretty cool game, I've done the campaign a few times, never really knowing how to play the game properly until I read the manual on the CD. The way the manual was written, it sounds like the writers really think they're in the 26th Century. Bigger guns it is then. I'll see what I can do to enlarge the front gun. The rear guns can probably stay small. OK, here's the new MF-205. I redid the front gun, now an MP2000 twin Heavy Phaser Cannon, though it is still complemented by the rear two MP1750 twin Heavy Phaser Cannons. I also repainted the armor, added antenna, put vents behind the pilot compartment, did some smoothing to the front side slopes (Thanks Dino! 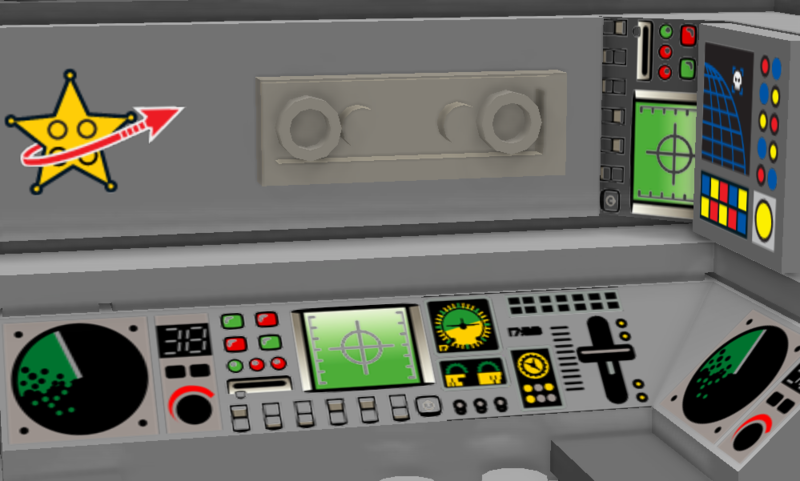 ), added more for the ventral (underside) repulsorlift vents, and repainted "that thing" on the roof, I'm not yet sure its functionality, maybe it's a deflector shield wrapper or a big sensor. Included in the .lxf file is a photonic mortar cannon which can replace any of the guns. Of course, lxf file: http://www.us.lego.com/en-us/gallery/77c8e98c-732b-4208-8086-7f189d414bb4?index=1 At this moment in time its still being moderated but the mods are pretty fast. EDIT: Oh, and 2 feet of armor. Honestly, this one's a real eye-popper - the SNOT's really well done, and the whole craft is very nicely sculpted. Vaguely reminds me of a troop transport from Star Wars. I like the final scene pic, and as others have pointed out, the cockpit details are really good too. Great job! I'm currently refitting this, and the more I dig into it the more I appreciate the detailed, complicated building structure well hidden in this model. Great job talmid!